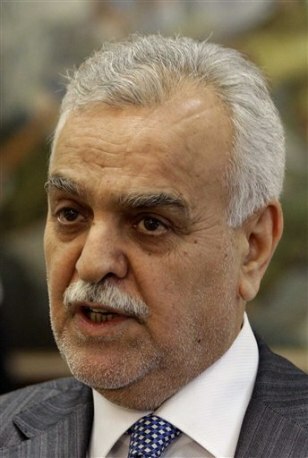 Iraq's Sunni Vice President Tariq al-Hashemi speaks during an interview with the Associated Press near Sulaimaniyah, 160 miles northeast of Baghdad, Iraq. Iraq's Shiite-led government has formally demanded that authorities in the semiautonomous Kurdish region hand over the country's top Sunni official, who is wanted on terrorism charges. Vice President Tariq al-Hashemi had been charged with organizing death squads to assassinate prominent figures several years ago.